BenefitScape can help you NOW with any IRS ACA related penalty..click for help? IRS Penalties Have Arrived via Letter 226J ..Are you Ready? The IRS has announced that their new software system, ACA Compliance Validation System (ACV) is now operational and it will identify potentially non-compliant Applicable Large Employers and produce a NOTICE OF Proposed Penalty (Letter 226J). You must act quickly or face significant fines. We are here to help! Every penalty assessment is unique. There hundreds of different reasons why a penalty may not apply to a given employee and researching each option requires a detailed professional analysis. In order to help you IMMEDIATELY we need to review your Penalty Letter (226J) to provide the correct remedy for you. An expert compliance analyst along with our in-house legal counsel will review your individual situation to determine the best approach to reducing any penalties. To get started you should click on this link: . This will pop up a form to initiate contact with BenefitScape for secure upload of the Letter 226J and other correspondence such as IRS Form 14765 (Employees who received a PTC and initiated a penalty). All materials you provide are held to be CONFIDENTIAL and you will receive a confirmation after you upload your materials. With all this information, we will schedule a call to review your alternatives. How the penalty system works. The Penalty Assessment is Presumed to be Correct! The “Proposed ESRP” penalty in letter 226J is presumed to be correct and if an employer does not object and provide the necessary evidence showing the assumption is false, the IRS will send a bill and begin collections. The IRS has been developing specialized software to handle the complexities relative to ACA penalties. The result is a new system, IRS ACA Compliance Validation System (ACV). There will be three main databases that are coordinated to determine penalties. IRS AIR database which contains the employer’s month by month coded representation of offers of coverage to full-time employees. Government marketplace feeds concerning those individuals who received Premium Tax Credits (PTC) i.e. subsidies for coverage obtained through the marketplace. Individual tax returns which contain information about eligibility and receipt of premium tax credits. Given the hundreds of millions of data elements and the complex IRS coding regulations there are likely to be errors and discrepancies that need to be addressed. This is no simple task and is an ideal task for software implementation. It is up to the employer to rebut this presumption that a penalty is due (i.e. prove the IRS is wrong) by first objecting to the penalty and then providing adequate evidence that any employee that the IRS has determined received a PTC, did or did not create a penalty for the employer. To do this, the employer needs to carefully examine all of the employment and healthcare offer details for an employee. These may show that the employee was not Full-Time, was in a waiting period, was offered adequate and affordable Health coverage, or for some other reason did not initiate a penalty. This is done by providing the required IRS ACA related Codes based on the employee details. This process may validate, reduce or even eliminate certain penalties. Responding to Letter 226J requires immediate and careful attention to protect your organization from costly penalties! If a dispute isn’t completed correctly or enough supporting documentation, has not been provided, employers will receive a bill. Disputing a bill and collection processes is more complicated than handling any penalty abatement in the first place. If you have received a Proposed Penalty (Letter 226J) you must reply within 30 days from the date of notification. It contains complete instructions and you can state your reasons for disagreement. You can use this Form to agree to pay or dispute the penalty. 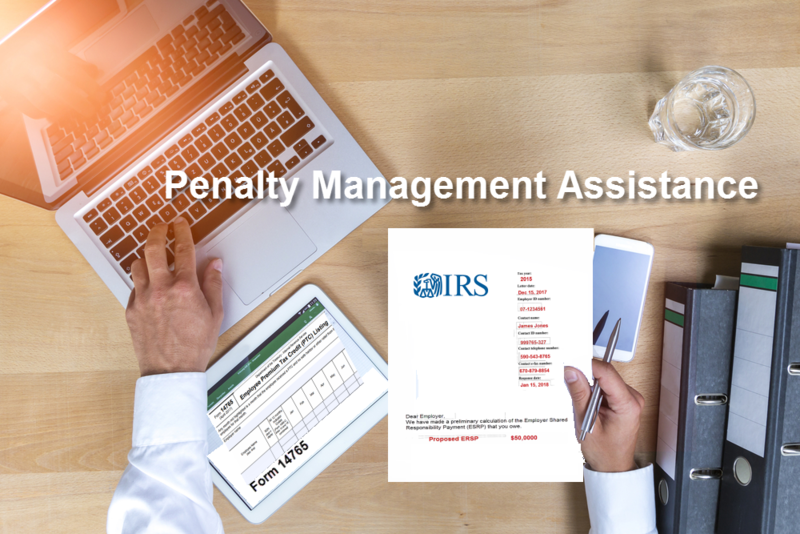 You may also Designate a Contact for the IRS to indicate who will be providing the required evidence required to dispute anypenalty payment. This evidence is complex and very detailed. Providing proof to the IRS is best handled by a professional familiar with the ACA regulations, codes, and process required. We can help here and be your Designated Responder. The IRS provides this Form to indicate which employees have received a Premium Tax Credit (PTC) and therefore generated a penalty for the Employer. You will need to prepare your evidence on each individual on the Form 14765 PTC List, determine if the employee was eligible for and received an Offer of Health Coverage and correct the specific codes. If provided properly, this will often remove or reduce the penalty.Below is the Form 14765 that must be returned to the IRS with the corrected answers. Applies to: all full-time employees who receive a subsidy and did not have a safe harbor code for the month Penalty amount: $260.00 per employee per month.